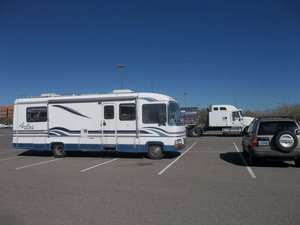 The Desert Diamond Casino in Tucson allows RVers and truckers to stay for free in the level paved parking lot on the south end of the property. Enter from the south entrance on Nogales Highway. They actually paid me to stay there since I got a free buffet for joining their club and won almost $5 on a slot machine. One night a truck parked next to me and ran their engine all night, and occasional trains go by on the other side of the highway sometimes sounding their horns. Verizon internet was good, as was local TV reception. Hi Blars! Hope all is well with you!! Spent a couple of days in Q, last week. Sorry I missed you. Hope to see you on my way to TX in January. We stayed one night at Desert Diamond Casino on our way from Deming, NM to Phoenix last month(November 2013). We touched base with the manager on duty and were warmly welcomed. We were offered $15 in free play each as well as a free buffet which was quite tasty. We won a combined $21 so we took our full bellies on back to the parking lot and had a very pleasant desert evening. The designated parking area was pretty much deserted and included a beautiful landscaped area full of cacti and fragrant sage. I will mention that you hear and see planes flying overhead with the airport directly across the street, but if you have traveled awhile and are really ready to sleep, such things are barely a nuisance. We were told by management that we could stay a week, roll on to another location for one day, and then stay another full week if we would like. We only needed that one night stay as we were anxious to get to Phoenix and a cozy guestroom with friends. This was out first casino stay and it was pleasant enough to convince us that this is another great way to boondock. Thanks for your blog and post on freecampsites.net-it is so helpful to have photos and details from fellow travelers. Follow my fiance' Mike and I on our travels at brendalovesmike.wordpress.com.